"How can I convert DAT to MP4 for mobile? Is there any available DAT video converter to finish the DAT to MP4 conversion task? Please recommend me a useful video conversion tool. Thank you in advance." As is known to all, there are many types of DAT files, for example, text-based DAT files, video DAT files, Email attachment DAT files and more. The text-based DAT files can be viewed in a text editor, but the video DAT file can't be played easily. Actually, DAT video file is MPEG1 or MPEG2 format with DAT extension and stored on VCD (Video CD). For now, DAT is only supported by VCD/DVD/Blu-ray player, Windows Media Player prior to version 9 and QuickTime with plug-in installed. Unfortunately, DAT video file is not compatible with other popular media players, video editing software or mobile devices like iTunes, iPod, iPhone, iPad, Android, iMovie, Xbox, Final Cut Pro and more. Thus, to freely play DAT files anywhere anytime, you are suggested to convert DAT to MP4 video format (one of the most popular formats supported by almost all media players, video editing software and portable devices.). * convert DAT to MP4 with orginal quality reserved for free replaying on iPhone, iPad, iPod, iTunes, iMovie, QuickTime, Samsung Galaxy, Windows Media Player, Xbox, etc. * decode DAT to MP4 with world's fastest speed thanks to its multi-core CPU utility, hyper-threading tech and Intel Quick Sync Video hardware acceleration tech. * convert DAT to other popular video formats like convert DAT to MOV, WebM, MKV, AVI, FLV, AAC, MP3 and more 180 video formats and 14 popular audio formats on Mac/Win. * edit DAT video files by its powerful video edit functions like merge, split, crop, cut, rotate, increase volume, add subtitle to MP4/add watermark, change bitrate/sample rate, remove subtitle, or even reduce files size. Ahead of DAT to MP4 conversion, you should download this DAT video converter on your Mac computer (macOS Sierra/El Capitan included); if you are a Windows user, you ought to download Windows version (Win 10 supported). Next, follow the below guide to easily convert DAT to MP4 Mac/Win. Open up this DAT converter on your computer and tap "+ Video" button to load DAT file that you wanna convert. Or just drag and drop your DAT file to this DAT video file converter. BTW, this program supports converting DAT files in batch. 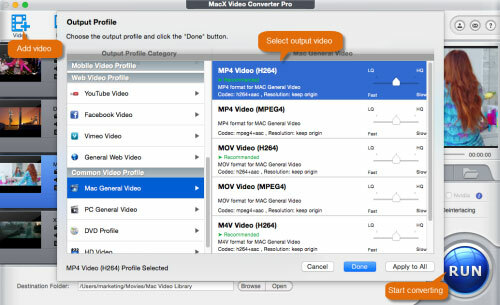 Set MP4 as output video format from the drop-down windows. In addition to MP4, you also can choose MOV, AVI, FLV, iPhone 7/7 Plus/SE/6s/6s Plus, iPad Air 2, iPad Mini 4, iPad Pro, iPod, Apple TV 4, iTunes, iMovies, Samsung Galaxy S7 edge, HTC One M9, etc as output format. Hit "Run" button to start converting DAT to MP4 with 5X faster speed than other competitors and zero quality loss. 1. This DAT file converter to MP4 also supports converting video among any HD and SD video formats, e.g., MKV to AVI, MKV to MP4, AVI to MP4, WMV to MOV, VOB to MP4, FLV to MP4, AVCHD to MOV, H265 to MP4, MP4 to MP3, MPEG to MP4, etc. 2. What's more, this program allows users to free download online videos and music in 8K/4K UHD, 1080P/720P HD, 3D, VR, MP4, MOV, etc from other 300+ video sharing sites, including Facebook, Yahoo, Dailymotion, Vimeo, Vevo, Metacafe, Myspace and many more. Download the topmost DAT to MP4 video converter - MacX Video Converter Pro to easily convert DAT to MP4 on macOS and Windows with original quality reserved in 5x faster speed than other DAT to MP4 converters.